I love Margery Allingham's style. Yes, some of her books have racism and sexism that reflects the era and British attitudes of their time, that is yuck. But her style is amazing. She's one of the authors I'd like to emulate. Her mystery novels are so much more than puzzles. 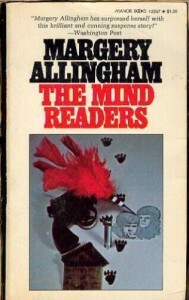 "The Mind Readers" is one of her later books, published in 1965, and although I'm too lazy to get the book out and accurately quote her forward to it, she mentions there that the story within may not be fiction by the time the book is published. To me, as I read the entire forward, that meant she was talking with people who fervently believed in ESP and so forth. So "The Mind Reader" was the book that came to my mind when I read that Jennifer Lawrence wants to direct a movie on mental warfare in the 1960s.